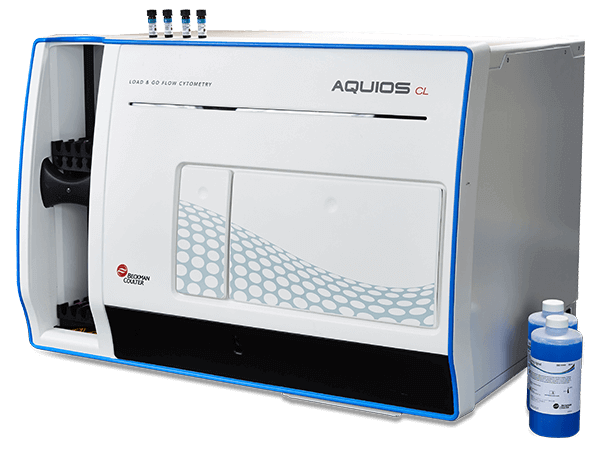 The AQUIOS CL Flow Cytometer is a benchtop instrument capable of combining automated sample preparation and cellular analysis in a compact system. A 488 nm Solid State Diode Laser provides the light source for scatter and fluorescence measurements. Measurable parameters include Forward-Scatter (FS) and Electronic Volume (EV) for sizing, Side-Scatter (SS) for granularity measurements, and up to four independent fluorescence parameters. Easy to learn, easy to use, ideal for cross-training your lab staff, and represents a breakthrough solution to the most basic operational challenges of flow cytometry. With the Aquios CL you can minimize hands-on time with an integrated system that incorporates automated loading, sample preparation, reagent management, barcode scanning, data analysis, and full LIS connectivity. Minimizes exposure to potentially biohazardous material, such as open blood tubes. Aquios CL uses cap piercing technology, so you never have to deal with open blood tubes. The Aquios CL provides a 24/7 flow cytometry service, as the unit can be operated safely by minimally trained users. There’s minimize potential for user error inherent in systems that require numerous manual steps to set up and run. Accelerate your test turnaround time with high-throughput performance that eliminates many of the least efficient features of existing systems. Includes a computer-based onsite training system to get users up to speed quickly. The AQUIOS CL Flow Cytometer is intended for use with in vitro diagnostic flow cytometric applications using up to four fluorescent detection channels using a blue (488 nm) laser, two light scatter detection channels and electronic volume (EV).